Finding and correcting interferences to the body's own natural state of good healthis what modern chiropractic care is all about. Chiropractic is based on applying scientific to stimulating your body's own remarkable resources. These important self-regulation and self-healing functions are controlled by your brain, spinal cord, and nerves. The vertebral subluxation complex (VSC) is a name given to the abnormal movement of spinal joints and associated changes in the nervous system. This degenerative condition can directly cause symptoms such as back or neck pain and seemingly un-associated symptoms such as headaches, arm and leg numbness or pain. Research has found that correcting VSC's, by adjustment and physical medicine proceedures, can lead to long term improvements or correction of a person's musculoskeletal problems. 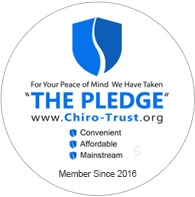 Although chiropractic is used most frequently to relieve low back pain, medical studies have found it to be effective for a variety of conditions, headaches, neck and shoulder pain, carpal tunnel syndrome, fibromyalgia, and sciatica. Chiropractic adjustments or manipulations are extremely safe. The risk factor is estimated to be in excess of five million to one. Chiropractors receive an education that emphasizes neuromuscular diagnosis and treatment. Preparation for the practice of chiropractic is concentrated on three areas of learning; basic training in the biological and health sciences (anatomy, physiology, histology, biochemistry, clinical and radiological diagnosis); specialized training in the chiropractic discipline (theoretical studies, practice, diagnosis and applications); and extensive clinical training. A chiropractor will spend over 4,000 hours in class not counting labs and clinic time. Multiple medical studies have documented the effectiveness of chiropractic in relieving back pain, neck pain and headaches. More recent studies have shown chiropractic to be effective in shoulder problems and migraine headaches. The first thing a chiropractor will do is ask you about the health complaints about which you are chiefly concerned. The DC will also ask about your family history, prior complaints and other care you may have had (chiropractic, osteopathic, medical, etc. ), your job, and other questions designed to help determine the nature of your illness and the best way to go about treating the problem. A vertebral subluxation is any structural and/or functional abnormality of the joints of the spine. These dysfunctions often result in kineseopathophysiology (abnormal movements) and neuropathophysiology (abnormal nerve function).